Type: Alkaline. Voltage: 4.5 V.
Length: 67 mm. Height: 62 mm Width: 22 mm. Contacts: two brass spring strips, + positive contact 19x6 mm and - negative contact 30x6 mm. Price: £4.49 each. (£3.99 if you buy two or more). Postage and packing included. Equivalent to: MN1203 / 3LR12G / 3LR12 / 3LR12R / 4.5V / 1289 / 3LR12 / 3LR12R / GP312 / Varta 4012. This 3LR12 (MN1203, 3LR12G, 3LR12, 3LR12R, 1289) Alkaline Energizer Ultra + 4.5 Volt battery block is commonly used in cycle lamps and torches. The 3LR12 (MN1203, 3LR12G, 3LR12, 3LR12R, 1289) Alkaline Energizer Ultra + 4.5 Volt battery is often found powering electric door-bells.. 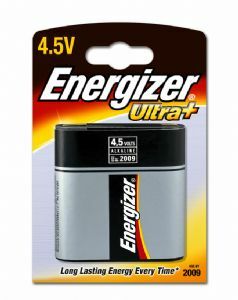 This 3LR12 (MN1203, 3LR12G, 3LR12, 3LR12R, 1289) Alkaline Energizer Ultra + 4.5 Volt battery has Alkaline chemistry, which is a significant improvement on Carbon Zinc and Zinc Chloride equivalents and makes it an fantastic very-long-lasting battery for lamps, flash-lights and torches. If you don't need the stamina of an alkaline 3LR12 you will be satisfied with our heavy duty zinc chloride 3R12. The 3LR12 (MN1203, 3LR12G, 3LR12, 3LR12R, 1289) 4.5 Volt battery has a shelf life of several years. Why not buy two or more, take advantage of our reduced price and make sure you are not left without a light next time your battery runs out.